This article describes how to use the detail rows expression of a measure to obtain the equivalent of creating table functions in DAX. This allows the reusing of a table expression in multiple CALCULATE filters. A Tabular model in compatibility level 1400 provides a property named Detail Rows Expression, which is designed to provide control over drillthrough results from MDX queries. The same table expression can also be evaluated in DAX by using the DETAILROWS function. As of July 2018, this is the only way to define a table expression in a Tabular model that can be reused in other DAX expressions. Therefore a possible alternative use of this feature is defining a complex table expression in a single place – then reusing it in multiple places by just invoking a DETAILROWS function. Special thanks to Daniel Otykier for sharing the original idea. WARNING: The DETAILROWS function was not designed for the purposes described in this article. The query plan generated using this technique is not optimal, negatively impacting expressions involving time intelligence calculations specifically. However, the lack of alternatives can make this feature appealing once its performance is considered acceptable for a specific data model. As of July 2018, this feature is available in models created in Azure Analysis Services and Analysis Services 2017, but not in models created in Power BI. However, any client – including Power BI and Excel – can consume measures written using this technique. The following descriptions assume knowledge of the user interface to set the Detail Rows Expression in a Tabular model. This is described in the article Controlling drillthrough using Detail Rows Expressions in DAX. The line filtering the product color is identical in both measures. From a maintenance point of view, any change to the filter logic must be replicated in every measure using the same filter. From a readability point of view, it could be hard to read different measures where 90% of the code is a shared filter. Create a hidden calculated table without any relationships to other tables. Create a measure for each table expression. Hide the measure to client tools. Name the measure to identify the table returned by Detail Rows Expression. Assign an ERROR function as the measure expression, with a message clarifying that the purpose of the measure is to provide just the Detail Rows Expression. This way, the measure will not be used in any report. Assign the table expression to the Detail Rows Expression property of the measure. Reference the table expression using DETAILROWS and passing the measure name as argument. Considering that this technique is very useful for sharing complex filter arguments of CALCULATE functions, we name filter measures those measures created only to provide an expression to DETAILROWS. Examples of complex filters that could benefit from this technique are same-store sales, dynamic classifications of customers or products, and complex time intelligence expressions. However, this technique shows performance issues when used to select standard time intelligence functions based on dynamic conditions. This problem is described later in the article. 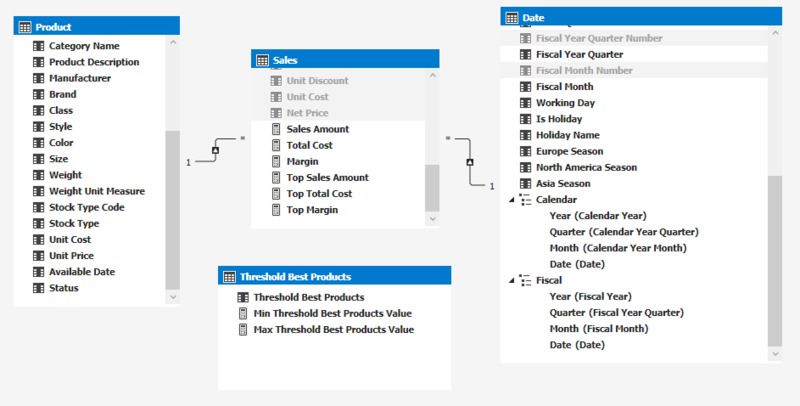 Consider a data model with sales of products and dates, plus a table that has no relationships and is only used to display a slicer that defines a range of values. The measures with the prefix Top compute the corresponding base measures but only filtering the products that in the entire year, have a sales amount within the range of values selected in the slicer. The following is a simple report using this data model. The matrix shows the Top Sales Amount measure. The BestYearProducts variable contains the same filter used by all the “Top” measures. The goal is to move this filter into a Detail Rows Expression. A zip file is available for download at the bottom of this article. 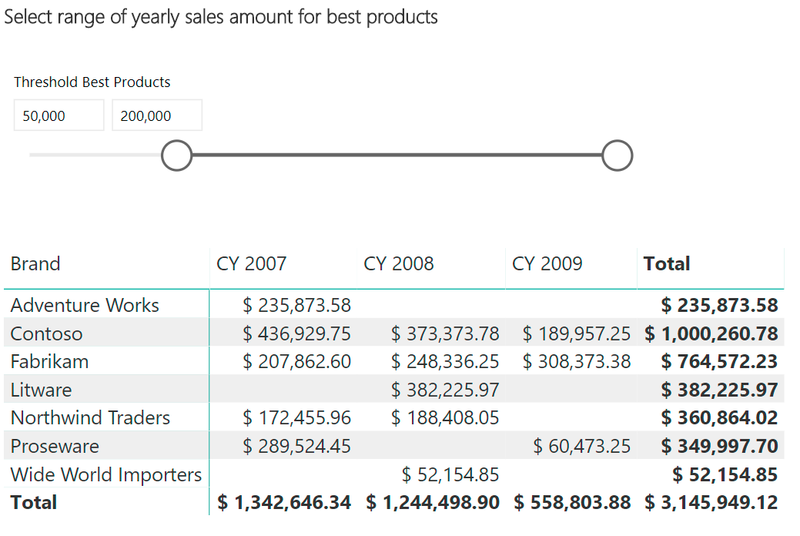 It includes a backup of the data model created with Analysis Services 2017 and the Power BI report used in this example. 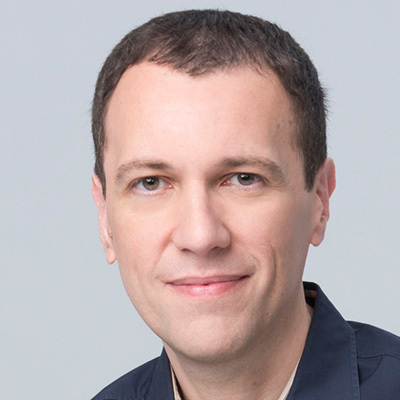 The Detail Rows Expression property was not designed for the purposes described in this article. DETAILROWS works as expected from a functionality point of view, but it could complicate the query plan when used as a filter argument of CALCULATE compared to pasting the expression straight into the CALCULATE function. ISBLANK ( aggregation ) || aggregation = "Regular"
VAR isYtd = aggregation = "Year to date"
VAR isMtd = aggregation = "Month to date"
VAR isLast12 = aggregation = "Last 12 months"
Ideally, the table expression in DETAILROWS should not have too many conditional statements. This is true also for the table expression used directly in a filter argument of CALCULATE. Just because DETAILROWS makes it easier to reuse a complex filter, does not mean that performance should not be a concern. Creating table functions used through DETAILROWS could be a workaround for the lack of custom table functions in DAX. This feature is necessary in order to avoid code duplication of complex filters in multiple CALCULATE statements. Indeed, it is error-prone and complex to maintain in case a change to a common filter logic is required. Sharing table functions using DETAILROWS might introduce performance issues, so its use must always be tested with a real-world amount of data. However, the cost of using DETAILROWS might be affordable for simple and linear expressions that do not have conditional branches.